The Chief Executive of the Islamic Republic of Afghanistan, Dr. Abdullah Abdullah met with high ranking delegation of UN Security Council in his office. The two sides spoke about regional issues, combatting terrorism, counter-narcotics, addressing terrorists’ sanctuaries, border violations in eastern part of the country and sanctions against terrorist groups especially the Taliban. 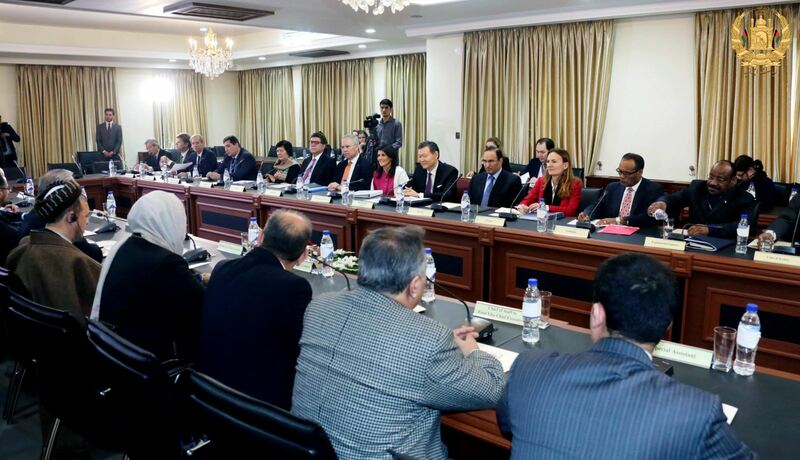 The United Nations Security Council also discussed on the process of democracy, good governance and reform, economic and development plans of the National Unity Government. First, Kazakhstan's Ambassador to the United Nations and periodical chairman of the UN Security Council, Kairat Umarov said they had come to meet with various groups of the Afghan community and following analysis of the situation to plan their cooperation and assistance to Afghanistan. Then, Ms. Nikki Haley, the United States Ambassador to the United Nations spoke on electoral reform, counter-narcotics and political situation in Afghanistan. Then, representatives of the member states in UN Security Council emphasized on cooperation with Afghanistan in the fight against terrorism, putting pressure on supporters of terrorists and also contribution to the development and reconstruction of Afghanistan. The Chief Executive welcomed the delegation of UN Security Council to Kabul and called their assessment of Afghanistan’s situation important. Dr. Abdullah, while explaining the situation in the country, noted of the performances and challenges of the National Unity Government and said that over the past three years they had lost opportunities in terms of reform and good governance. The National Unity Government was a new experience in Afghanistan, and now both parties involved are committed to working together, the Chief Executive said. The Chief Executive emphasized on decentralization of the administrative and bureaucratic system in the country, adding that over focus on decision-making in the capital has caused problems. Dr. Abdullah spoke about challenges and advances in the fight against terrorism, saying that the people of Afghanistan offered many victims for defending their land and fighting against terrorists. The Chief Executive added that they have always been looking for continuous and sustainable reforms and believe that continuous reform was a basic condition for a change. "We hope that we will improve the situation by doing activities which have an impact on daily life of the people," said the Chief Executive, pointing to the increase gap between the people and the government. Dr. Abdullah stressed on his determination for holding elections and fundamental reforms in the electoral commissions, saying that this government arose as a result of a bad election and, naturally, brought problems with it. The Chief Executive spoke of the government's firm determination to reform the electoral process. Dr. Abdullah noted that they are committed to holding elections and added that parliamentary, presidential and district council elections will be held at the scheduled time. The Chief Executive of the National Unity Government cited of the government's economic plans and said that small and large development projects have been launched across the country. Dr. Abdullah called the Citizenship Covenant as an important and effective project that was launched in very recent years. The Chief Executive said that the government has plans for capacity building at various levels. 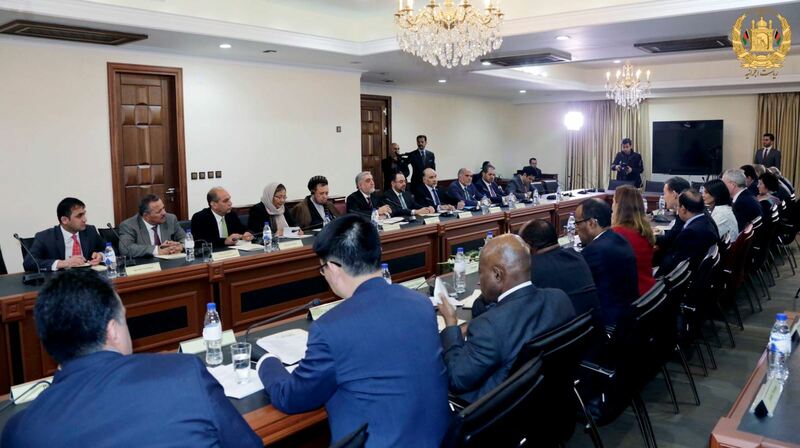 At the meeting, Alhaj Mohammad Mohaqeq, Second Deputy to the Chief Executive, Minister of Foreign Affairs, Salahuddin Rabbani, and Mahmoud Saiqal, the permanent representative of Afghanistan to the United Nations were also attended. The members of the UN Security Council were from the United States, China, Britain, Russia, France, Sweden, Poland, Kazakhstan, Bolivia, Ethiopia, Kuwait, Holland, Peru, Guinea and Ivory Coast.